Overall, Dubai has 18 completed and topped-out buildings that rise at least 300 metres (984 ft) in height, which is more than any other city in the world. Dubai has 73 completed and topped-out buildings that rise at least 200 metres (656 ft) in height, again which is more than any other city in the world. Based on the average height of the ten tallest completed buildings, Dubai has the tallest skyline in the Middle East and the world. As of 2012[update], the skyline of Dubai is ranked sixth in the world with 248 buildings rising at least 100 metres (330 ft) in height. The history of skyscrapers in Dubai began with the construction of Dubai World Trade Centre in 1979, which is usually regarded as the first high-rise in the city. At the time of its completion, it also stood as the tallest building in the Middle East. 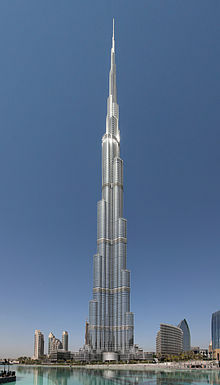 Since 1999, and especially from 2005 onwards, Dubai has been the site of an extremely large skyscraper building boom, with all 73 of its buildings over 200 metres (656 ft) tall completed after 1999. In less than ten years, the city has amassed one of the largest skylines in the world; it is now home to the world's tallest building, the world's tallest residence, and the world's second tallest hotel. As of 2012[update], 363 new skyscrapers are under construction in Dubai; additionally, there are over 640 active high-rise developments that have been proposed for construction in the city. This list ranks completed and topped out Dubai skyscrapers that stand at least 200 metres (656 ft) tall, based on standard height measurement. This includes spires and architectural details but does not include antenna masts. An equal sign (=) following a rank indicates the same height between two or more buildings. The "Year" column indicates the year in which a building was completed. 1 Burj Khalifa 828 metres (2,717 ft) 163(spire total floor211/f) 2010  This building was completed in 2010, becoming the tallest building in the world. 2 Marina 101 425 metres (1,394 ft) 101 2017 Completed in 2017, it is the 2nd-tallest residential building in the world, after 432 Park Avenue. 3 Princess Tower 414 metres (1,358 ft) 101 2012  Former tallest residential building in the world. Now 432 Park Avenue holds the record. 4 23 Marina 392.8 metres (1,289 ft) 88 2012  It was the world's tallest all-residential building until the completion of the nearby Princess Tower. 7 Almas Tower 360 metres (1,180 ft) 68 2008  Tallest office building in the city. 8 Gevora Hotel 356 metres (1,168 ft) 75 2017 Tallest Hotel in the world. 9= JW Marriott Marquis Dubai Tower 1 355 metres (1,165 ft) 76 2012  Second tallest hotel in the world after Gevora Hotel. 9= JW Marriott Marquis Dubai Tower 2 355 metres (1,165 ft) 76 2012  Second tallest hotel in the world after Gevora Hotel. 11 Emirates Office Tower 355 metres (1,165 ft) 54 2000  Also known as Emirates Tower One. 12 The Torch 352 metres (1,155 ft) 79 2011  The Torch tower became the tallest residential building in the world in 2011. (in the back) 333 metres (1,093 ft) 72 2007  The second tallest hotel in the world and the first skyscraper in Dubai over 300 metres (984 ft). 15 Al Yaqoub Tower 328 metres (1,076 ft) 69 2013  Inspired by the Clock tower of the Wesminister Palace in London. 17 Burj Al Arab 321 metres (1,053 ft) 60 1999  Tallest building in the world used exclusively as a hotel since its completion. Also the tallest hotel on a man made island and also the tallest hotel on an island. 20 Jumeirah Emirates Towers Hotel 309 metres (1,014 ft) 56 2000  Also known as Emirates Tower Two. 45 Dubai Marriott Harbour Hotel & Suites 254 metres (833 ft) 59 2007  Also known as the Al Marsa Tower. 53 AAM Tower 244 metres (801 ft) 46 2008  Also known as the Arenco Tower. 60 Al Tayer Tower 225 metres (738 ft) 59 2009  Also known as the Manazel Al Safa Tower. This is the list of buildings that are currently under construction in Dubai and are expected to rise to a height of at least 150 metres (492 ft). Buildings under construction that have already been topped out are also included, as are those whose construction has been suspended. Dubai Creek Tower 1,345 metres (4,413 ft) 210 2020 Construction began in 2016. Foundation complete. *Table entries with dashes (—) indicate that information regarding building dates of completion has not yet been released. This table lists buildings that were at one time under construction in Dubai and were expected to rise at least 180 metres (591 ft) in height, but are now on hold. While not officially cancelled, construction has been suspended on each development. Pentominium 516 metres (1,693 ft) 122 2022 Will become tallest residential building in the world if construction resumes. This table lists buildings that are approved for construction in Dubai and are expected to rise at least 180 metres (591 ft) in height. Burj 2020 660 metres (2,170 ft) 115 – The Burj 2020 will be the largest commercial tower in the world, surpassing the just-built One World Trade Centre in New York. The tower's district will provide commercial, retail, and hotel accommodation. The tower and surrounding areas will also be added to Dubai's International Free Trade Zone. This table lists buildings that are proposed for construction in Dubai and are expected to rise at least 180 metres (591 ft) in height. Dubai City Tower 2,400 metres (7,900 ft) 400 2055 Also Known as Dubai Vertical City Dubai City Tower will be the tallest tower ever built by man when completed. *Table entries with dashes (—) indicate that information regarding building heights and/or dates of completion has not yet been released. Al Fahidi Fort is the oldest building in Dubai and was the tallest for 179 years. This is a list of the buildings that once were the tallest in Dubai. Despite Dubai's recent major skyscraper boom, there are only seven buildings on the list. ^ a b "About Dubai". Emporis.com. Archived from the original on 2012-09-27. Retrieved 2012-09-17. ^ a b c "Burj Khalifa". SkyscraperPage.com. Archived from the original on 2012-10-11. Retrieved 2012-09-17. ^ "Princess Tower". SkyscraperPage.com. Archived from the original on 2012-09-28. Retrieved 2012-09-17. 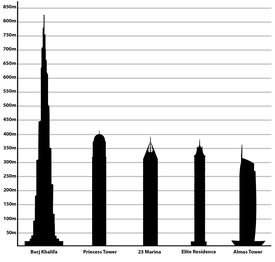 ^ a b "List of Tallest Buildings in Dubai". CTBUH. Archived from the original on 2013-08-01. Retrieved 2012-09-17. ^ "The Tallest Buildings in Dubai". Lookup.ae. Archived from the original on 15 March 2015. Retrieved 25 March 2015. ^ "Tallest 25 Skylines Cities". ultrapolisproject.com. The Ultrapolis Project. Archived from the original on 2012-09-22. Retrieved 2012-09-17. ^ "Cities with the most skyscrapers". Emprois.com. Archived from the original on 2012-10-03. Retrieved 2012-09-17. ^ "Burj Khalifa". Council on tallest Buildings and Urban Habitate. Archived from the original on 2010-01-09. Retrieved 2010-09-03. ^ "Burj Khalifa". Emporis.com. Archived from the original on 2011-08-05. Retrieved 2010-09-03. ^ "Burj Khalifa". DubaiAssets.com. Archived from the original on 2013-01-22. Retrieved 2012-06-14. ^ "Princess Tower". CTBUH. Archived from the original on 2012-09-17. Retrieved 2012-09-17. ^ "23 Marina". CTBUH. Archived from the original on 2012-10-24. Retrieved 2012-09-17. ^ "23 Marina". SkyscraperPage.com. Archived from the original on 2012-09-28. Retrieved 2012-09-17. ^ "Elite Residence". CTBUH. Archived from the original on 2012-10-31. Retrieved 2012-09-17. ^ "Elite Residence". SkyscraperPage.com. Archived from the original on 2012-08-12. Retrieved 2012-09-17. ^ "Almas Tower". Emporis.com. Archived from the original on 2008-03-16. Retrieved 2012-09-17. ^ a b "Almas Tower". SkyscraperPage.com. Archived from the original on 2012-08-25. Retrieved 2012-09-17. ^ "Almas Tower". CTBUH. Archived from the original on 2013-03-05. Retrieved 2012-09-17. ^ a b JW Marriott Marquis Hotel Dubai. "JW Marriott Marquis Hotel Dubai: Dubai Luxury Hotels". Marriott.com. Archived from the original on 2012-12-07. Retrieved 2012-12-15. ^ "Emirates Park Tower 1". SkyscraperPage.com. Archived from the original on 2012-10-13. Retrieved 2012-09-17. ^ "Emirates Park Tower 2". SkyscraperPage.com. Archived from the original on 2012-10-13. Retrieved 2012-09-17. ^ a b "Emirates Office Tower". Emporis.com. Archived from the original on 2008-03-16. Retrieved 2012-09-17. ^ "Emirates Office Tower". SkyscraperPage.com. Archived from the original on 2012-08-08. Retrieved 2012-09-17. ^ "The Torch". CTBUH. Archived from the original on 2012-10-31. Retrieved 2012-09-17. ^ "Rose Rayhaan by Rotana". Emporis.com. Archived from the original on 2008-03-16. Retrieved 2012-09-17. ^ "Rose Rayhaan by Rotana". SkyscraperPage.com. Archived from the original on 2007-10-22. Retrieved 2007-11-20. ^ "Rose Rayhaan by Rotana". CTBUH. Archived from the original on 2012-08-18. Retrieved 2012-09-17. ^ "Al Yaqoub Tower". CTBUH. Archived from the original on 2013-04-03. Retrieved 2012-09-17. ^ "Al Yaquob Tower". SkyscraperPage.com. Archived from the original on 2007-12-03. Retrieved 2007-12-01. ^ "The Index". CTBUH. Archived from the original on 2013-06-30. Retrieved 2012-09-17. ^ "The Index". Emporis.com. Archived from the original on 2007-05-01. Retrieved 2007-11-12. ^ "The Index". SkyscraperPage.com. Archived from the original on 2007-12-21. Retrieved 2007-12-01. ^ a b "Burj Al Arab". Emporis.com. Archived from the original on 2007-09-30. Retrieved 2007-11-12. ^ "Burj al Arab". SkyscraperPage.com. Archived from the original on 2007-11-12. Retrieved 2007-11-20. ^ "HHHR Tower". CTBUH. Archived from the original on 2012-10-30. Retrieved 2012-09-17. ^ "HHHR Tower". SkyscraperPage.com. Archived from the original on 2008-04-20. Retrieved 2008-04-14. ^ "Damac Properties announces concrete frame completion of Ocean Heights | Damac Properties". AMEinfo.com. Archived from the original on 2011-04-04. Retrieved 2012-08-21. ^ "Jumeirah Emirates Towers Hotel". Emporis.com. Archived from the original on 2008-03-16. Retrieved 2007-11-12. ^ "Emirates Hotel Tower". SkyscraperPage.com. Archived from the original on 2007-10-22. Retrieved 2007-11-20. ^ "Infinity Tower". CTBUH. Archived from the original on 2013-01-31. Retrieved 2012-09-18. ^ "Infinity Tower". SkyscraperPage.com. Archived from the original on 2012-09-28. Retrieved 2012-09-18. ^ "Dubai seeks cause of massive hotel fire at New Year". BBC. Archived from the original on 2016-01-01. Retrieved 2015-02-01. ^ "The Address Downtown Dubai". CTBUH. Archived from the original on 2012-10-28. Retrieved 2012-09-17. ^ "The Address Downtown Burj Dubai". SkyscraperPage.com. Archived from the original on 2012-10-18. Retrieved 2012-09-17. ^ "Emirates Crown". Emporis.com. Archived from the original on 2008-03-16. Retrieved 2012-09-18. ^ "Emirates Crown". SkyscraperPage.com. Archived from the original on 2012-09-30. Retrieved 2012-09-18. ^ "Khalid Al Attar Tower 2". Emporis.com. Retrieved 2012-09-18. ^ "Khalid Al Attar Towers". SkyscraperPage.com. Archived from the original on 2012-09-28. Retrieved 2012-09-18. ^ "Sulafa Tower". Emporis.com. Archived from the original on 2007-05-07. Retrieved 2007-11-12. ^ "Sulafa Tower". SkyscraperPage.com. Archived from the original on 2007-12-21. Retrieved 2007-12-01. ^ "Millennium Tower". Emporis.com. Archived from the original on 2007-09-30. Retrieved 2007-11-12. ^ "Millenium Tower". SkyscraperPage.com. Archived from the original on 2007-10-22. Retrieved 2007-11-20. ^ "D1 Tower". Emporis.com. Archived from the original on 2007-05-10. Retrieved 2007-11-12. ^ "D1 Tower". SkyscraperPage.com. Archived from the original on 2007-12-21. Retrieved 2007-12-01. ^ "Hotel JAL Tower". CTBUH. Archived from the original on 2012-08-19. Retrieved 2012-10-06. ^ "Nikko Hotel Dubai". Emporis.com. Retrieved 2007-11-12. ^ "Nikko Hotel Dubai". SkyscraperPage.com. Archived from the original on 2007-12-21. Retrieved 2007-12-01. ^ "21st Century Tower". Emporis.com. Archived from the original on 2007-09-30. Retrieved 2007-11-12. ^ "21st Century Tower". SkyscraperPage.com. Archived from the original on 2007-10-22. Retrieved 2007-11-20. ^ "Al Kazim Tower 1". Emporis.com. Archived from the original on 2008-03-16. Retrieved 2007-11-12. ^ "Al Kazim Tower 1". SkyscraperPage.com. Archived from the original on 2007-12-21. Retrieved 2007-12-01. ^ "Al Kazim Tower 2". Emporis.com. Archived from the original on 2008-03-16. Retrieved 2007-11-12. ^ "Al Kazim Tower 2". SkyscraperPage.com. Archived from the original on 2007-12-21. Retrieved 2007-12-01. ^ "Ubora Tower 1". Emporis.com. Archived from the original on 2007-02-11. Retrieved 2012-09-23. ^ "U-Bora Tower 1". CTBUH. Archived from the original on 2012-12-02. Retrieved 2012-09-23. ^ "Central Park Resiential Tower". Emporis.com. Retrieved 2008-04-14. ^ "Central Park Residential Tower". SkyscraperPage.com. Archived from the original on 2008-06-10. Retrieved 2008-04-14. ^ "The Vision Tower". Emporis.com. Archived from the original on 2007-05-25. Retrieved 2012-08-17. ^ "Vision Tower". SkyscraperPage.com. Archived from the original on 2012-08-08. Retrieved 2012-08-17. ^ CTBUH. "Conrad Hotel Facts | CTBUH Skyscraper Database". 25.22608 55.28361: Skyscrapercenter.com. Archived from the original on 2013-08-01. Retrieved 2012-12-15. ^ "Conrad Hotel". Emporis.com. Retrieved 2008-04-14. ^ "Conrad Hotel". SkyscraperPage.com. Archived from the original on 2008-06-10. Retrieved 2008-04-14. ^ "Emirates Marina Serviced Apartments & Spa". Emporis.com. Archived from the original on 2008-03-16. Retrieved 2012-08-23. ^ "Al Marsa Tower". CTBUH. Archived from the original on 2013-08-01. Retrieved 2012-08-23. ^ "Angsana Hotel & Suites 1". Emporis.com. Archived from the original on 2007-05-26. Retrieved 2007-12-08. ^ "Angsana Hotel & Suites 1". SkyscraperPage.com. Archived from the original on 2008-02-22. Retrieved 2007-12-08. ^ "Chelsea Tower". Emporis.com. Archived from the original on 2007-09-30. Retrieved 2007-11-12. ^ "Chelsea Tower". SkyscraperPage.com. Archived from the original on 2007-10-22. Retrieved 2007-11-20. ^ "Ahmed Khoory Tower". CTBUH. Archived from the original on 2013-08-01. Retrieved 2012-09-22. ^ a b "Al Tayer Tower". Emporis.com. Archived from the original on 2007-02-14. Retrieved 2007-11-12. ^ "Al Tayer Tower". SkyscraperPage.com. Archived from the original on 2007-12-21. Retrieved 2007-12-01. ^ "Rolex Tower". CTBUH. Archived from the original on 2013-08-01. Retrieved 2012-08-23. ^ "Al Fattan Tower". Emporis.com. Archived from the original on 2007-09-30. Retrieved 2007-11-12. ^ "Al Fattan Tower". SkyscraperPage.com. Archived from the original on 2007-10-22. Retrieved 2007-11-20. ^ "Oasis Beach Tower". Emporis.com. Archived from the original on 2007-09-29. Retrieved 2007-11-12. ^ "Oasis Beach Tower". SkyscraperPage.com. Archived from the original on 2007-10-22. Retrieved 2007-11-20. ^ "AAM Tower". Emporis.com. Archived from the original on 2007-02-06. Retrieved 2008-04-12. ^ "AAM Tower". SkyscraperPage.com. Archived from the original on 2011-05-25. Retrieved 2008-04-12. ^ "The Tower". Emporis.com. Archived from the original on 2007-09-29. Retrieved 2007-11-12. ^ "The Tower". SkyscraperPage.com. Archived from the original on 2007-10-22. Retrieved 2007-11-20. ^ "Sama Tower". CTBUH. Archived from the original on 2013-08-01. Retrieved 2012-08-23. ^ "Sama Tower". Emporis.com. Retrieved 2012-08-23. ^ "Churchill Residence". CTBUH. Archived from the original on 2013-07-21. Retrieved 2012-08-23. ^ "Churchill Residency, Dubai". SkyscraperPage.com. Archived from the original on 2012-08-08. Retrieved 2012-08-23. ^ "The Buildings by Daman". CTBUH. Archived from the original on 2013-08-01. Retrieved 2012-09-29. ^ "The Buildings by Daman". Emporis.com. Archived from the original on 2007-10-16. Retrieved 2007-11-12. ^ "The Buildings by Daman". SkyscraperPage.com. Archived from the original on 2007-12-21. Retrieved 2007-12-01. ^ "Park Place". Emporis.com. Archived from the original on 2007-09-30. Retrieved 2007-11-12. ^ "Park Place". SkyscraperPage.com. Archived from the original on 2007-12-03. Retrieved 2007-11-20. ^ "Mag 218 Tower". Emporis.com. Archived from the original on 2007-09-30. Retrieved 2007-12-06. ^ "Mag 218 Tower". SkyscraperPage.com. Archived from the original on 2007-12-21. Retrieved 2007-12-06. ^ "Al Tayer Tower". CTBUH. Archived from the original on 2013-08-06. Retrieved 2012-08-23. ^ "The Bay Gate". Emporis.com. Archived from the original on 2007-05-04. Retrieved 2012-09-17. ^ "The Bay Gate". CTBUH. Archived from the original on 2013-07-21. Retrieved 2012-09-17. ^ "Angsana Hotel Tower". CTBUH. Archived from the original on 2012-08-18. Retrieved 2012-09-23. ^ "Angsana Suites Tower". CTBUH. Archived from the original on 2013-08-01. Retrieved 2012-09-23. ^ "Angsana Hotel & Suites 1". SkyscraperPage.com. Archived from the original on 2008-02-22. Retrieved 2012-09-23. ^ "Al Bateen Tower". Emporis.com. Archived from the original on 2007-05-08. Retrieved 2007-12-06. ^ "Al Bateen Tower". SkyscraperPage.com. Archived from the original on 2011-05-25. Retrieved 2007-12-06. ^ "Jumeirah Bay 2". Emporis.com. Retrieved 2012-09-29. ^ "Jumeirah Bay 2". SkyscraperPage.com. Archived from the original on 2012-10-11. Retrieved 2012-09-29. ^ a b "Sadaf 4". Emporis.com. Archived from the original on 2012-10-16. Retrieved 2012-09-29. ^ a b "Jumeirah Beach Residence C07". SkyscraperPage.com. Archived from the original on 2012-09-23. Retrieved 2012-09-29. ^ "JBR Area C Tower C07". Emporis.com. Archived from the original on 2007-05-01. Retrieved 2007-12-06. ^ "Jumeirah Beach Residence C07". SkyscraperPage.com. Archived from the original on 2011-05-25. Retrieved 2007-12-06. ^ "Al Seef Tower". Emporis.com. Archived from the original on 2007-09-30. Retrieved 2007-11-12. ^ "Al Seef Tower". SkyscraperPage.com. Archived from the original on 2005-11-27. Retrieved 2007-11-20. ^ "Grosvenor House The Residence". Emporis.com. Archived from the original on 2007-02-06. Retrieved 2007-11-12. ^ "Grosvenor House The Residence". SkyscraperPage.com. Archived from the original on 2008-10-06. Retrieved 2007-12-01. ^ "Grosvenor House West Marina Beach". Emporis.com. Archived from the original on 2007-02-04. Retrieved 2007-11-12. ^ "Grosvenor House Hotel and Apartments". SkyscraperPage.com. Archived from the original on 2008-10-06. Retrieved 2007-11-20. ^ "Al Rostamani Maze Tower". CTBUH. Archived from the original on 16 October 2012. Retrieved 18 February 2013. ^ "Latifa Tower". CTBUH. Archived from the original on 1 August 2013. Retrieved 18 February 2013. ^ "Le Reve". Emporis.com. Archived from the original on 2008-03-17. Retrieved 2007-11-12. ^ "La Reve". SkyscraperPage.com. Archived from the original on 2005-04-27. Retrieved 2007-11-20. ^ "Marina Heights". CTBUH. Archived from the original on 2013-08-01. Retrieved 2012-09-29. ^ "Marina Heights Tower". Emporis.com. Archived from the original on 2008-03-17. Retrieved 2007-11-12. ^ "Marina Heights". SkyscraperPage.com. Archived from the original on 2005-11-28. Retrieved 2007-11-20. ^ "JBR Area B Tower B01". Emporis.com. Archived from the original on 2007-04-29. Retrieved 2007-12-06. ^ "Jumeirah Beach Residence B01". SkyscraperPage.com. Archived from the original on 2011-05-25. Retrieved 2007-12-06. ^ "Marina Crown". Emporis.com. Archived from the original on 2008-03-17. Retrieved 2007-11-12. ^ "Marina Crown". SkyscraperPage.com. Archived from the original on 2005-12-08. Retrieved 2007-11-20. ^ "Tamani Hotel Marina". Emporis.com. Archived from the original on 2007-05-29. Retrieved 2007-11-12. ^ "Number One Dubai Marina". SkyscraperPage.com. Archived from the original on 2008-10-12. Retrieved 2007-11-20. ^ "Acico Office Tower". Emporis.com. Archived from the original on 2007-05-01. Retrieved 2008-01-05. ^ "Acico Office Tower". SkyscraperPage.com. Archived from the original on 2011-05-25. Retrieved 2008-01-05. ^ "The Citadel". Emporis.com. Archived from the original on 2007-05-25. Retrieved 2008-04-12. ^ "The Citadel". SkyscraperPage.com. Archived from the original on 2011-05-25. Retrieved 2008-04-12. ^ "MBK Tower". CTBUH. Archived from the original on 2013-08-01. Retrieved 2012-09-29. ^ "Shangri-La Hotel". CTBUH. Archived from the original on 2012-08-18. Retrieved 2012-10-06. ^ "Shangri-La Hotel". Emporis.com. Archived from the original on 2007-05-19. Retrieved 2007-11-12. ^ "Shangri-La Hotel". SkyscraperPage.com. Archived from the original on 2005-04-27. Retrieved 2007-11-20. ^ Nicholson-Cole, David (2016-07-26). "Why we're obsessed with building tall". CNN Style. Cable News Network. Archived from the original on 2016-08-12. Retrieved 2016-08-12. ^ "/ The Tower at Dubai Creek Harbour". CTBUH. Archived from the original on 2016-07-31. Retrieved 2016-07-14. ^ "Entisar Tower". CTBUH. Archived from the original on 2016-07-08. Retrieved 2016-07-14. ^ "Marina 106". CTBUH. Archived from the original on 2015-09-15. Retrieved 2015-09-01. ^ "Dubai Pearl Tower | Buildings". Dubai /: Emporis. Retrieved 2012-08-21. ^ "Pentominium". Emporis.com. Archived from the original on 2007-05-03. Retrieved 2007-11-12. ^ "Pentominium". SkyscraperPage.com. Archived from the original on 2007-11-15. Retrieved 2007-12-01. ^ "I&M Tower". Emporis.com. Archived from the original on 2007-05-29. Retrieved 2008-04-14. ^ "I&M Tower". SkyscraperPage.com. Archived from the original on 2011-05-25. Retrieved 2009-04-14. ^ "The Trump Palm International Hotel & Tower". CTBUH. Archived from the original on 2013-08-01. Retrieved 2012-10-06. ^ "Metro Tower". Emporis.com. Retrieved 2008-04-14. ^ "Anantara Hotel". CTBUH. Archived from the original on 2013-08-01. Retrieved 2012-10-06. ^ "Tiara United Tower 1". Emporis.com. Archived from the original on 2007-05-04. Retrieved 2007-11-12. ^ "Tiara United Tower 1". SkyscraperPage.com. Archived from the original on 2007-02-10. Retrieved 2007-12-01. ^ "Tiara United Tower 2". Emporis.com. Archived from the original on 2007-05-04. Retrieved 2007-11-12. ^ "Tiara United Tower 2". SkyscraperPage.com. Archived from the original on 2007-02-10. Retrieved 2007-12-01. ^ "Jumeirah Lake Apartments". CTBUH. Archived from the original on 2013-08-01. Retrieved 2012-10-06. ^ "Jumeirah Lake Offices". CTBUH. Archived from the original on 2013-08-01. Retrieved 2012-10-06. ^ a b "Boraq Tower". Emporis.com. Retrieved 2007-12-02. ^ a b "Al Boraq Tower". SkyscraperPage.com. Archived from the original on 2011-06-29. Retrieved 2007-12-02. ^ "Meydan launches huge Dubai project with world's tallest residential tower". ^ "Dubai One". skyscrapercenter.com. Archived from the original on 2016-07-10. ^ CTBUH. "The-newshub.com". Archived from the original on 2016-01-21. ^ "The Address Residence Fountain Views III". Emaar.com. Archived from the original on 2013-08-29. Retrieved 2013-04-06. ^ "The Grand Boulevard Tower 1". Emporis.com. Retrieved 2012-08-24. ^ "Marina Arcade". Emporis.com. Retrieved 2012-08-24. ^ "Emaar launches new Burj Vista project in Dubai". emirates247.com. Archived from the original on 2013-04-25. Retrieved 2013-04-25. ^ "JB Tower". Emporis.com. Retrieved 2012-08-24. ^ "Escan Tower". Emporis.com. Archived from the original on 2011-06-04. Retrieved 2012-08-24. ^ "Burjside Terrace". Emporis.com. Archived from the original on 2011-06-04. Retrieved 2012-08-24. ^ CTBUH. "The Mansion at Burj Khalifa Facts | CTBUH Skyscraper Database". 0.00000 0.00000: Buildingdb.ctbuh.org. Archived from the original on 2012-02-20. Retrieved 2012-08-21. ^ "Nili Tower". Emporis.com. Retrieved 2007-12-02. ^ "Nili Tower". SkyscraperPage.com. Archived from the original on 2011-05-25. Retrieved 2007-12-02. ^ "IRIS Mist". Emporis.com. Archived from the original on 2011-06-04. Retrieved 2010-02-20. ^ "Iris Mist". SkyscraperPage.com. Archived from the original on 2012-10-19. Retrieved 2012-09-24. ^ "The Sheffield Tower". Emporis.com. Retrieved 2007-12-02. ^ "The Sheffield Tower". SkyscraperPage.com. Archived from the original on 2011-05-25. Retrieved 2007-12-02. ^ "Fortune Araames". Emporis.com. Retrieved 2007-12-02. ^ "Fortune Araames". SkyscraperPage.com. Archived from the original on 2011-05-25. Retrieved 2007-12-02. ^ "El Matador Tower". Emporis.com. Archived from the original on 2007-05-22. Retrieved 2007-12-02. ^ "El Matador Tower". SkyscraperPage.com. Archived from the original on 2011-05-25. Retrieved 2007-12-02. ^ "Mag 220 Tower". Emporis.com. Archived from the original on 2007-05-10. Retrieved 2007-12-02. ^ "Mag 220 Tower". SkyscraperPage.com. Archived from the original on 2011-05-25. Retrieved 2007-12-02. ^ "Arabian Crowne". Emporis.com. Archived from the original on 2007-06-06. Retrieved 2012-09-24. ^ "Arabian Crowne". SkyscraperPage.com. Archived from the original on 2012-09-29. Retrieved 2012-09-24. ^ "The Plans for the 1.55-Mile-High Skyscraper in, You Guessed It, Dubai". gizmodo.com. Archived from the original on 2013-06-02. Retrieved 2013-04-23. ^ "The Plans For The 'World's Tallest Tower' Have Been Unveiled". Yahoo News. Archived from the original on 2016-05-07. Retrieved 2016-05-02. ^ "One Park Avenue". SkyscraperPage.com. Archived from the original on 2012-10-04. Retrieved 2012-09-24. ^ "Burj Al Fattan". Emporis.com. Archived from the original on 2013-12-07. Retrieved 2012-09-24. ^ "DIFC Tower 1". Emporis.com. Retrieved 2012-08-24. ^ "Dynamic Architecture Building". Emporis.com. Retrieved 2012-09-24. ^ "P-17". Emporis.com. Retrieved 2012-08-24. ^ "Hard Rock Hotel". SkyscraperPage.com. Archived from the original on 2012-10-07. Retrieved 2012-08-24. ^ "Signature Towers Office". Emporis.com. Archived from the original on 2007-05-15. Retrieved 2007-11-12. ^ a b c "Signature Towers". SkyscraperPage.com. Archived from the original on 2009-10-24. Retrieved 2007-12-01. ^ a b "The Circle". SkyscraperPage.com. Archived from the original on 2013-08-01. Retrieved 2012-09-24. ^ "Sheikh Hasher Tower". SkyscraperPage.com. Archived from the original on 2012-09-28. Retrieved 2012-08-24. ^ "Signature Towers Hotel". Emporis.com. Archived from the original on 2007-05-14. Retrieved 2007-11-12. ^ "G-Tower". Emporis.com. Archived from the original on 2007-05-30. Retrieved 2008-02-16. ^ "G-Tower". SkyscraperPage.com. Archived from the original on 2008-04-11. Retrieved 2008-02-16. ^ "Signature Towers Residential". Emporis.com. Archived from the original on 2007-02-11. Retrieved 2012-08-24. ^ "Saba Tower 4". Emporis.com. Retrieved 2012-08-24. ^ "Saba Tower 4". SkyscraperPage.com. Archived from the original on 2012-08-08. Retrieved 2012-08-24. ^ "The old...turned new". Gulf News. 2001-10-25. Archived from the original on 2008-04-25. Retrieved 2008-03-15. ^ "Dubai Museum". SkyscraperPage.com. Archived from the original on 2004-06-08. Retrieved 2007-11-12. ^ "Sheikh Rashid Building". Emporis.com. Retrieved 2018-07-16. ^ "World Trade Center". SkyscraperPage.com. Archived from the original on 2005-04-27. Retrieved 2007-11-12. "Buildings in Dubai". Emporis.com. Retrieved 2012-10-06. "Skyscraper Center: Dubai Completed and Topped Out Skyscrapers". CTBUH. Retrieved 2012-10-06. Wikimedia Commons has media related to Skyscrapers in Dubai. This page was last edited on 25 March 2019, at 20:25 (UTC).